I love golden age Captain Marvel comics! For me, they are a great way to relax and be entertained as well as inspired by the adventures of the world's mightiest mortal. I own three golden age comics and a good number of the 1970's Shazam comics. Purchasing these comics can be expensive and does require you do some homework before making a buying decision. I'd like to share some thoughts and tips based on some of my lessons learned on how you can collect Captain Marvel comics! I recommend you start by collecting those issues that mean a lot to you - comics with stories that you would want to read time and again. That helps to narrow your search and ensure you buy something you won't regret later! 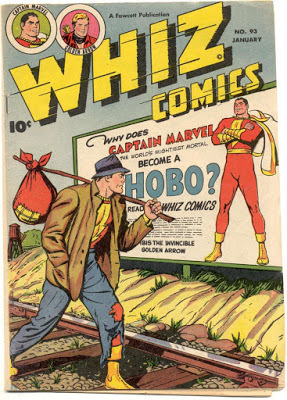 For example, one of my favorite Captain Marvel stories comes from Whiz Comics #93 when Cap becomes a hobo to reunite a family. I can read that story over and over, so it was the very first Captain Marvel comic I looked for and purchased for my collection. Next, you will want to start looking for a copy of the comic. You can check your local comic shop, comic convention, on-line stores and eBay. I've had good experiences on eBay and on-line comic shops. The local comic book shops in my area are limited as far as golden age comics are concerned! Once you've identified the comic issue you want to buy, start asking questions! These are questions you might want to ask depending on how important they are to you. What is the condition of the comic? Watch out for torn pages, loose pages, rolled spine, writing, mold or mildew, etc. If you have allergies, you may want to see if the comic comes from a smoke-free, pet free home. What are the seller's ratings (if buying on-line)? Are they dependable? Do they provide pictures of the comic and welcome you to ask questions? Are they providing a solid description of the comic? Something else to consider is comic book rating guides. Different sellers can use different ratings, and they can be confusing! For example, some comics can be rated high but still have some damage that you wouldn't want (missing pages, etc.). Don't go by the ratings alone! Ask questions and know the condition before you buy. Again, make sure the comic is in a condition you are happy with. Buying Cap's golden age comics is a lot of fun. For me, I love holding a comic from the 40s or 50s and thinking about all the fans - young and old - that held and read that comic through the years. But buying golden age comics does require some effort and patience to make sure you're getting a comic you really want and in a condition you are satisfied with. I hope you've found this information helpful! !